Bob Woodward, he of Watergate fame, says Donald Trump’s persistent questioning about President Barack Obama’s place of birth is akin to the tactics of the odious Joe McCarthy, the Republican senator infamous for his communists-in-government witch-hunt during the early 1950s. The probing by Trump, the billionaire developer and prospective presidential candidate, prompted Obama this week to release the long form of his birth certificate, which clearly showed he was born in Hawaii in 1961. “Trump, I think, was or may be still aspiring to be the new Joe McCarthy,” Woodward said yesterday on the MSNBC talk show, Morning Joe. But why should anyone care what Woodward thinks about Trump and McCarthy? Woodward’s no expert on 1950s America. Besides, his claim about McCarthy was little more than glib and sanctimonious hyperbole: Trump’s aggressive badgering of Obama may have been hardball politics. 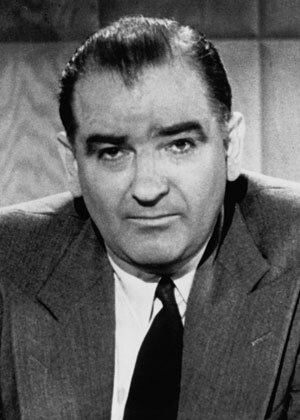 It was nothing akin to McCarthy’s wild accusations about communist infiltration of government, nothing like the senator’s bullying of witnesses under oath in closed session. Woodward’s a fine one to talk, anyway: It’s not as if his reporting on Watergate for the Washington Post — the reporting that won him lasting acclaim — was free of dubious technique. Far from it. Woodward and his Post colleague, Carl Bernstein, acknowledged in their book, All the President’s Men, to having committed ethical lapses during their Watergate reporting in the early 1970s. Notably, they recounted failed attempts to encourage federal grand jurors to violate oaths of secrecy and discuss Watergate testimony. Woodward and Bernstein conceded their efforts were “a seedy venture” that nonetheless had the approval of top editors at the Post, including the then-executive editor, Ben Bradlee. Their efforts to entice grand jurors to violate their oaths of secrecy were soon reported to federal prosecutors who in turn informed John Sirica, chief judge of U.S. District Court in the District of Columbia. Bernstein also acknowledged in All the President’s Men that he sought and obtained information from otherwise private telephone records. Their missteps represented serious misjudgments, which are rarely recalled these days, when the hero-worship of Woodward and Bernstein seems as intense as ever.